This speech “Tao of Startups” is one I gave to an audience of entrepreneurs and investors on March 23, 2018 at the China Accelerator 8x8 Event in Beijing. The purpose of the talk was to take the audience through the entire “cycle” of creating a startup and discuss what is important (and what is not important) during each phase. Doing a startup is difficult and can be extremely stressful. It can also be extremely fulfilling. I wanted to lead the audience through a “guided meditation” of sorts to put them in the proper frame of mind for doing a startup—to look at the process from a holistic point of view. I hope I was successful in some small way in accomplishing this! In the startup world, there is a lot of talk about the original “idea” or the “big idea”. Actually, the original idea is just a seed. It is a very small thing that has some potential. Just like the tree that grows large from a single seed does not in any way resemble the original seed; the idea looks very little like the final product. So, in a startup it makes no sense to focus too much on the original idea or who had it first. There is nothing new under the sun. 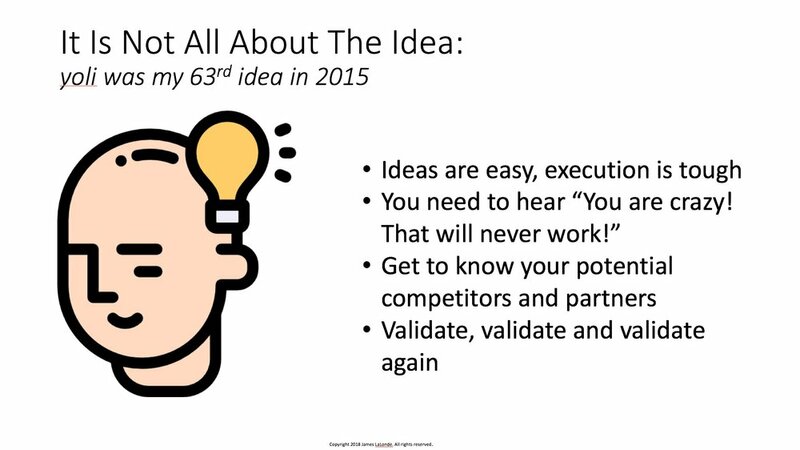 You are not the first person to think of the idea, nor is it your first idea. The trick is to choose the idea you want to build a startup on, validate it properly and then EXECUTE. A startup is all about execution, not the original idea. The best way to test and refine your idea is to pitch it. If you don’t do the hard work on this part you WILL miss valuable opportunities. All entrepreneurs should work on refining and perfecting their elevator pitches. Make it something you do every day like brushing your teeth. Like a yoga practitioner, practice every day. I do. I will take the video of this speech today and watch it several times by myself and with others who will give me feedback. Feedback and constructive criticism is essential! Seek it out, proactively. Assembling the right founding team is the most crucial decision would-be entrepreneurs face. It impacts almost everything you do in the beginning. You need to get this right! In China and around the world I do workshops focused on this particular topic. The best idea in the world and the best elevator pitch cannot be turned into reality without a good, balanced founding team. No one remembers the other co-founders of Facebook. Nor should they, because Facebook didn’t need 5 co-founders. Only two people of the five still work there today. Out of the top 20 reasons startups fail, most have a component that is related to founder issues. Don’t do a startup by yourself. If you are trying to do a startup by yourself it tells investors that you can’t convince anyone to join you, or your idea is bad, or both. The only one person startups are artists or consultants. Elon Musk famously said he never created a business plan. I don’t think you need to either. But you need to think seriously about your “business model”. You need to explain it to investors as it evolves. However, I find most first time entrepreneurs are intimidated by this. So, in the early stages of a startup you should spend time on what I call the “inverted T”. These are the core areas (value proposition, revenue, costs) you really need to have mastered when recruiting co-founders, investors, etc. 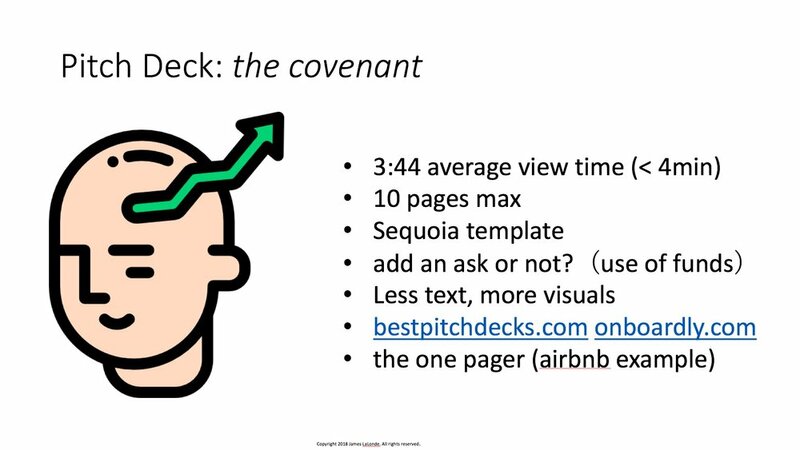 Yes, you need a good pitch deck. A pitch deck overview tells the world who you are and what you intend to do. But no startup ever got funded on a pitch deck alone. The average VC spends less than 4 minutes looking at a pitch deck. Sending a pitch deck to a VC can only give them a reason to NOT invest in your company. While a good pitch deck may pique an investor’s interest, a decision to invest will not be made just by seeing the pitch deck. Investors invest in people, not pitch decks. 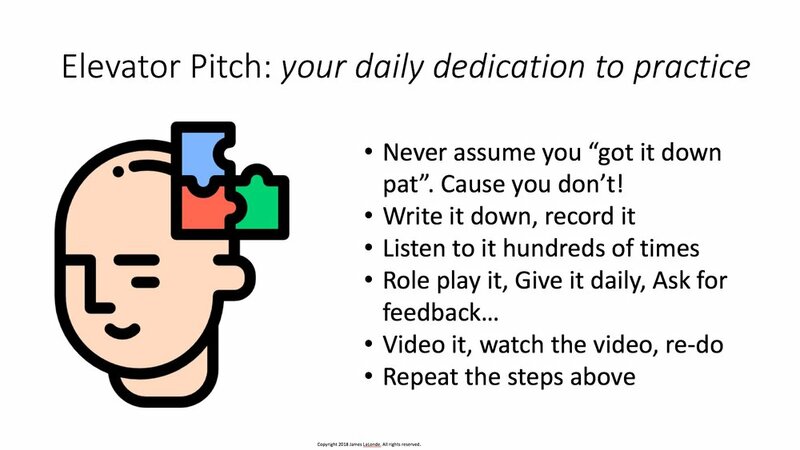 Spend some time crafting your pitch deck, show it to people, get good feedback and update it frequently. Personally, I almost never just send a pitch deck to an investor without a meeting first. There are lots of funding options out there. All have their pros and cons. Typically you don’t need any money to start. But you should think about what funding you might need and when or if you will need it. Where you get money to fund product development and growth is a decision that impacts almost every aspect of your startup--including your co-founder selection. Most first time founders feel that getting funding is the main objective in the startup. It is not. First you need to validate your idea and product. I have done “bootstrapped” startups which are funded by customer sales that have never taken outside funding. You don’t need a VC’s money to do a startup. The ironic thing about choosing co-founder(s) is that from the moment you decide who will be the founding team, you then need to divide up equity in the company. This should be done once and should be done right. Don’t fiddle with it or change it, ever. Do it once and then carve it in stone. While none of it really means anything unless your company has an equity event (a sale or IPO), it can cause lots of issues amongst founders and ruin the company if done improperly or if constantly changed. If the co-founders know each other really well they might be able do this in 5 minutes. If not, a long discussion and a lot of things will need to be discussed. It all boils down to who will do what and what experience does each person bring to the team. How much is your startup worth? There are no real rules or guidelines for setting the value of a startup company, but coming up with a valuation is absolutely necessary if you plan to accept money from an investor. This is the part of the startup process where the startup founder(s) and the investor(s) interests are diametrically opposed. The investor wants the most shares of your company for the lowest price and the founder(s) want to give up the fewest shares for the highest price. Getting investors to believe in you and your ability to deliver is key. There are no rules or formulas for doing this equitably. It is a pure negotiation. Every conversation with a potential investor is a chance to learn something. You had better look forward to these discussions as you will likely be having many of them. Most founders of famous companies (Google, Amazon, etc.) had to meet with more than 100 investors before getting that first key investment. In the meeting you must come across as relaxed. Make it a real conversation. Try to find out what the investor wants and see if it matches well with your vision. Be the Buddha! When you do find an investor that is right for you and you want to accept their money you need to certain things prepared: bank accounts, legal entity, etc. These things all need to be done and ready before you talk to investors. However, I find many first-time entrepreneurs spend too much time on them because doing them feels like checking off items on a check list. Make sure you prioritize these things properly and get them done at the right time.